We know these passages well, and others like them, about “running the race.” That in many ways the journey of discipleship in which we follow Jesus the Christ is a race that stretches us, grows us, challenges us, shows our weaknesses or proneness to fatigue, but ultimately perfects us (in love) as we persevere in the race. I’ve added the daily spiritual discipline suggested by the folks at Rethink Church this Advent in the photo-a-day challenge. Today’s word, “steadfast/steady” kept running (no pun intended) through my mind as I went for a walk/jog this morning in the gym at nearby Camden First UMC. When I go for a walk/jog/run and listen to music, I often get caught up in the flow of the lyrics or the beat of the music. At the onset of a particularly upbeat song, I have found myself all of a sudden picking up the pace, beating drums in the air (yeah, I’m sure I’m the laughing stock of the other walkers who use the facilities at Camden First UMC), kind of losing myself in the flow of things only to find several laps later that I’m winded and the unsteadiness of the changed pace takes its toll. This is particularly challenging to a person with asthma. Going through some change of rhythm is necessary in preparing for longer distance runs/jogs, but it takes training, and the body has to adapt to the change in physical tolerance. It can’t be done (well) through random erratic or spasmodic bursts. Again, it takes training. In our typical lives where we find ourselves rushed and hurried in so many ways, we often forget that Jesus saved the world at a pace of 3 miles an hour. In several emergency situations, Jesus is depicted as deliberative, yes, and perhaps urgent but not rushed. For instance, consider the episode(s) of Jairus’ 12-year-old daughter who was on the brink of death and the woman with an issue of blood for 12 years. At the pleading of Jairus, Jesus followed behind him to help Jairus’ daughter but allowed himself to be interrupted by the woman who touched the hem of Jesus’ cloak that she might be healed. In his healing mission, Jesus was steadily deliberative. The supernatural presence of God’s gifting might not have to be tumultuous and spasmodic. It could be steady and continuous. It is such a gifting that the community needs from its Davidic branch, as it does of any king. If Jesus in his mission went at a pace of 3 mph, the preparation for his arrival came even slower on the back of a lowly donkey, as legend has it. 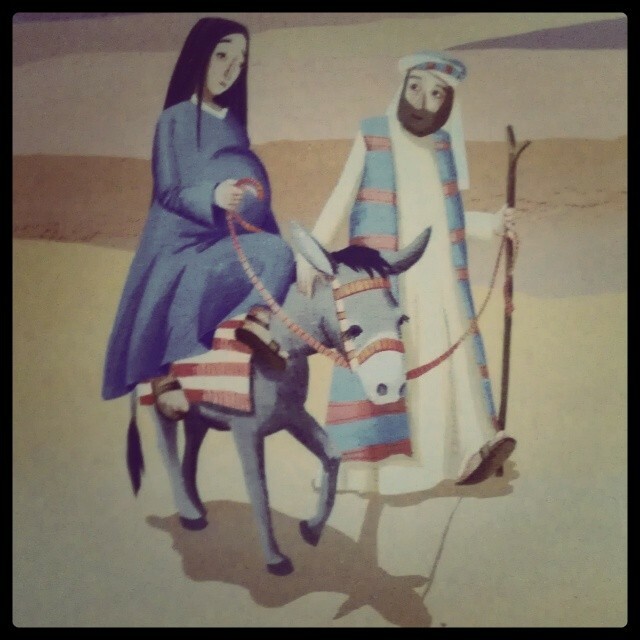 The road of Mary & Joseph to Bethlehem was a long journey that required steady pacing. And Advent is about that. On one level it’s about “slowing down” and not getting caught up in the “hustle and bustle” of the commercialism that often sweeps us away this time of year. But casting out the demon of rampant consumerism is not Christian discipleship in itself. Advent also, it seems to me, ought to be about inviting the abiding Spirit of God to steady us in the world, seeking God’s “wisdom and understanding,” “counsel and might,” and the “knowledge and worship” of the Lord. To join in Christ’s mission of bringing good news and “justice to the poor.” Advent is about steady preparation and pacing in growing as Jesus’ disciples and continuing this mission as we celebrate his first arrival and await Christ’s return. Some would advise that what the world and the various communities within it need in the meantime is a sudden burst of energy or enthusiasm in what has been experienced beforehand as revivalism. And while in some ways that may be what is needed in part, if it is not accompanied with the steady, abiding dependence on the presence of God’s Spirit in the mundane, ongoing day-to-day living and work of the Church, then we will have invested our energies on something fleeting and we’ll find ourselves too winded to carry on. Because the length of the race we’re set to run requires steadiness. Let us pace ourselves that we might finish the race. Come, thou long expected Jesus! Another great reflection of how important it is to be faithful and steady. You have a wonderful gift with words! I’m very proud of you and the work yo do! Thank you for this excellent word.